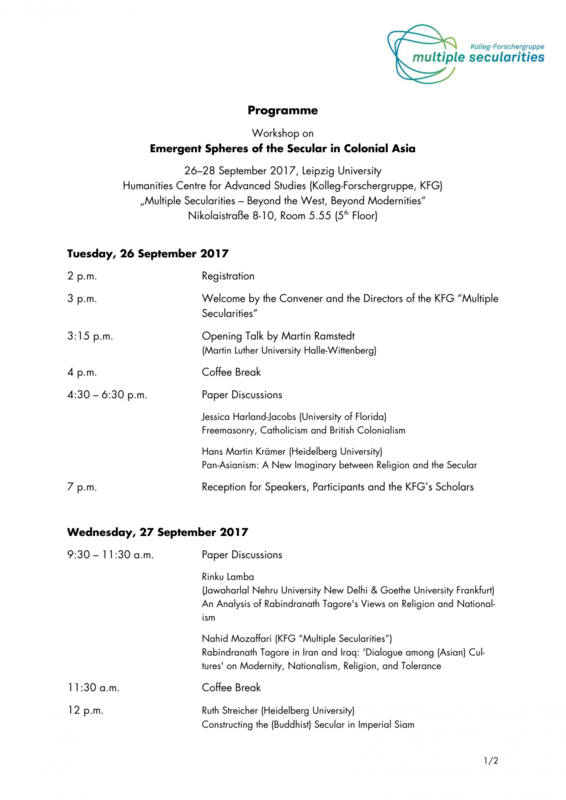 The workshop on “Emergent Spheres of the Secular in Colonial Asia” is firmly situated within the theoretical and methodological framework of the KFG “Multiple Secularities – Beyond the West, Beyond Modernities”. The discussions among the participants of the workshop are expected to zoom in on key interests of the KFG's research programme.The workshop seeks to further develop the theoretical and methodological framework of the KFG, and to provide historical analyses that are likely to suggest a variety of indications for possible path dependencies, to be further investigated by researchers concentrating on more recent periods. For our purpose, we conceive of “Colonial Asia” primarily as entangled histories of epistemic encounters that facilitated the emergence of all kinds of socio-cultural transformations in the societies involved in these encounters. These societies consisted not only of different Asian but also of different European societies. The workshop concentrates on specific histories of interaction between different Asian and European societies in the course of the 19th and early 20th Centuries - especially focussing on South, Southeast and East Asian societies, and the dynamics that connected these regions with “West Asia”, i.e., the Middle East, Egypt, Morocco and Turkey, and possibly Central Asia. These entangled histories of epistemic encounters, and the different political, economic and cultural dynamics accompanying them, constitute a rich field for investigating emergent spheres of the secular. These spheres, for instance, emerge in emic discourses about art, education, culture, and world religion, in attitudes towards modern science and technology, in instances of the historicisation of religion, the musealisation of sanctuaries, and the like. The development of steamship travel and steam-powered rotary printing presses in the 19th Century, as well as the organisation of Colonial World Exhibitions and Fairs in Europe and the colonies during the 19th and early 20th Centuries accelerated the communication of ideas within and between regions, expediting the spread of all kinds of new epistemes (such as Wahhabism, pan-Islamism, reform-Hin­duism, Gandhi-ism, reform-Buddhism, pan-Asianism, neo-Confucianism, communism, socialism, nationalism, comparative religion, orientalism, arts and crafts, life reform, scientism, and capitalism, etc.) in colonial Asia. New techniques of colonial governance (e.g., legal reform, census, education, economic regimes, military technologies) impacted greatly on the dissemination of ideas as well as resultant processes of differentiation and integration, which led to new distinctions between the religious and the non-religious both within and between social groups. The workshop is open to a limited number of listeners. 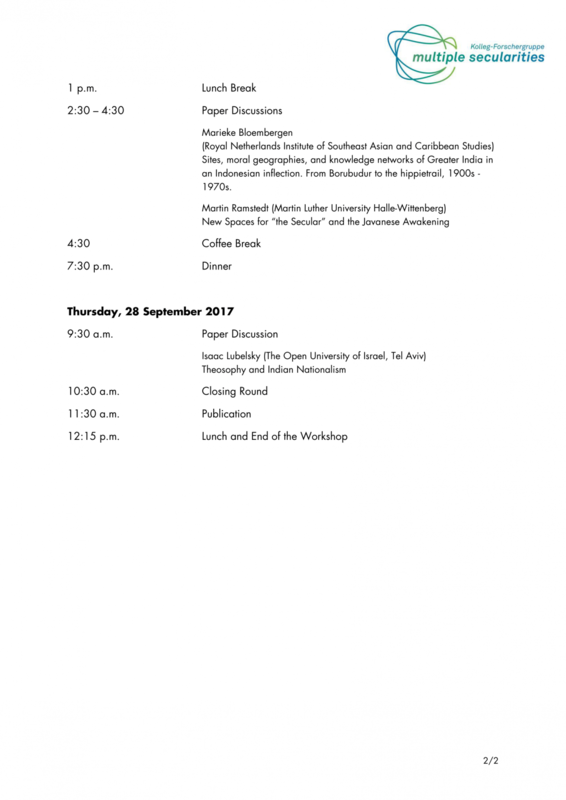 Please contact Johannes Duschka before 15 September 2017 if you wish to participate.